On August 2-4 I spent the weekend attending the 2013 Corpus Christie Men’s Retreat at Mount Saint Mary’s University in Emmittsburg, MD. On Saturday evening after dinner Father Larry graciously took some time to answer a few questions with yours truly. 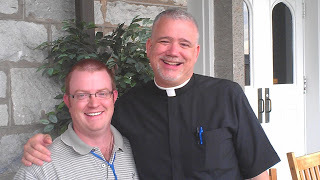 This week at The Catholic Book Blogger, I posted that interview which can be found here. While visiting, hop on over to enter this weeks giveaway where you could win a copy of Father Larry’s book Be A Man. You can enter the giveaway here. Lastly you can read my review of the book that changed life. This was perhaps my toughest review yet because of how personal it is. The review for Be A Man is posted here.